For our fifth annual list of the year’s top 10 title sequences, Art of the Title's panel of experts chose from among film, television, video games, and conferences. The Top 10 of 2018 were chosen based on criteria including originality and innovation, impact, atmosphere, relevance to subject matter, and technique. Paring the long list down from more than 200 to just 10 was a difficult task, but one done with relish. 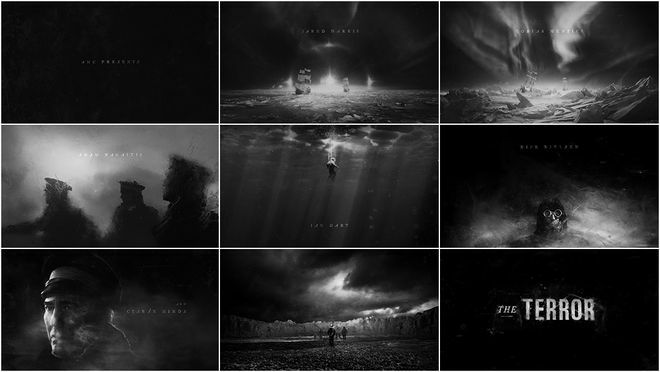 This year's title sequences were painstakingly created by teams large and small all around the world, with budgets modest and mighty, in state-of-the-art facilities and in home studios. So sit back, relax, and enjoy some of the most interesting and innovative work to hit screens this year. 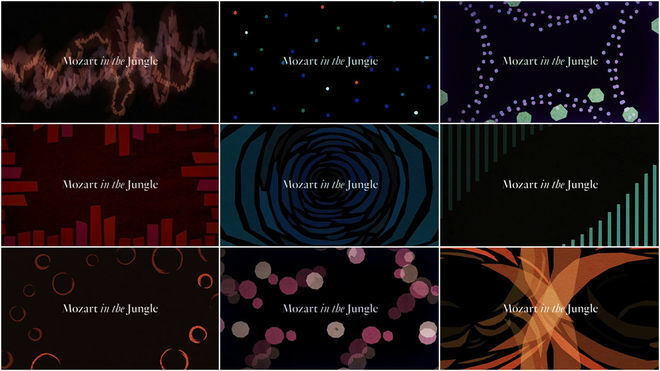 For Mozart in the Jungle’s fourth and final season, title designer Teddy Blanks moves away from the refined, geometric shapes of the series’ second season titles (also produced by CHIPS), and towards a more natural, hand-cut style reminiscent of Saul Bass’s early title design work. With its inconstant lines and organic but ordered feeling, Mozart’s season four titles are a joyous melding of music and graphic animation. Sound waves seemingly scribbled out in marker or formed from hastily cut construction paper flow, grow, and crash; abstracted hemispheres of the human brain light up and change colour in time to the music. The colours and shapes call to mind openings like Bonjour Tristesse or The Umbrellas of Cherbourg. The theme song, a classical rendition of "Lisztomania" by Phoenix, anchors each of the ten title sequences; however, the arrangements become increasingly experimental as the season progresses. This reflects the musical progression of the show’s conductor characters as well as the show itself, leading up to its adventurous and formally challenging final season. Episode 10’s opener acts as a coda of sorts for the season – and for the series – calling back to all the previous sequences as it rises to a crescendo. When a group of people are oppressed due to circumstances beyond their control, there’s bound to be trouble. It’s not the most subtle metaphor but within the fiction of The Darkest Minds it’s an effective way to deliver a message: Don’t fear the unknown. Based on Alexandra Bracken's novel of the same name, The Darkest Minds depicts a world where a pandemic decimates the children of the world, leaving the survivors with extraordinary powers. Those surviving children are rounded up by the government and assigned a colour based on their abilities and the dangers they pose to others. Understandably, they decide to fight back. Describing Austin Vesely’s werewolf-pizza Chance-the-Rapper comedy-horror film Slice is a mouthful. But with a premise like that, it’s no surprise that it bears a fully loaded, stuffed crust, dripping hot delight of a title sequence. Created by artist and animator I Saw John First (John Christian Ferner Apalnes), Slice’s titles are a cornucopia of body parts and blades, leather and lightning, neon demons and gnarly rides, all set to a synth- and bass-heavy score by composers Ludwig Göransson (who also scored 2018’s Venom) and Nathan Matthew David. Read our in-depth discussion with Artist I Saw John First and Director Austin Vesely. Over a few days every year Semi-Permanent Festival is a pixel-pumping, creativity-boosting, and future-making series of events taking place in Sydney, Australia, and beyond. And every year since its inception in 2003, a designer (or design team) is invited to create an opening title sequence to kick it all off. For Sydney’s 2018 edition, an electrifying magenta-and-indigo sequence launched the festivities, giving fans and attendees an eyeful of elastic typography, invigorating spirit, and colours bleeding every which way. It was directed by Joyce N. Ho, a creative director based in New York with projects including The Expanse (2015) and True Detective (2014) in her rearview. Studio Alma Mater (The Lego Movie) caps off one of 2018’s most visually striking films – animated or otherwise – with a spectacular main-on-end title sequence. Spider-Man: Into the Spider-Verse explores the well worn comic book trope of multiple universes colliding with disastrous results, and sees Spider-Men Miles Morales and Peter Parker bring together a team of Spider-People (and pigs) from across the multiverse to stop the Kingpin of Crime, Wilson Fisk, from destroying the very fabric of reality. Into the Spider-Verse’s end titles exploit this dimension-shattering conceit to its full potential, leaning into the film’s splash-page approach with Spider-Heroes and onomatopoeia leaping out from the flat, Ben-Day dot world of Silver Age-style comics and into a full stereoscopic 3D world. “What is it you want?” asks the voice. Strong and commanding and doling out direct questions, the voice tempts us with the strangest secret in the world. The sage advice comes from Earl Nightingale and his 1957 motivational book and audio recording, The Strangest Secret. It’s also the backbone of designer Ben Radatz’s purely typographic opening to conference Made in the Middle, a solidly engaging work that steamrolls and stretches text, alternating between steady restraint and invigorating energy. Read our in-depth discussion with Title Designer Ben Radatz. AMC’s horror anthology series The Terror puts a supernatural spin on one of the greatest maritime mysteries of all time: the disappearance of the Franklin Expedition. In 1845, Arctic explorer Sir John Franklin, two ships, and 128 crew set out to chart the fabled Northwest Passage — a sea route to connect Europe and Asia — and vanished in the Arctic, leaving scattered records and bleached bones. Arkady Anikeev is having a tough year. 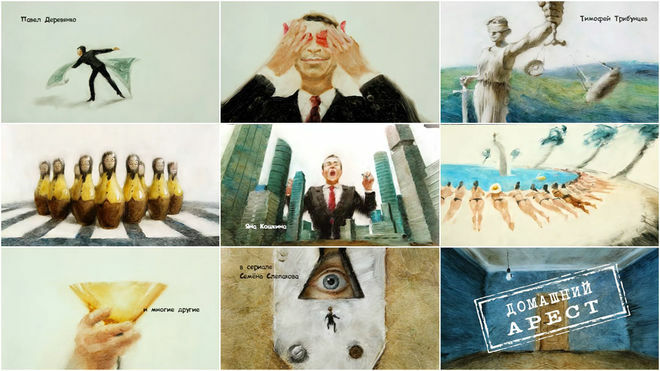 After being caught accepting bribes, Anikeev – once the mayor of the city of Sineozersk – is placed under house arrest, forced to live with the consequences of his actions and a host of zany characters. Not to be confused with Domashen Arest, the Bulgarian sitcom, Domashniy Arest is a Russian TV series that sees Anikeev help a childhood friend become the new mayor. What if you could live your life differently? How many different ways could you live? 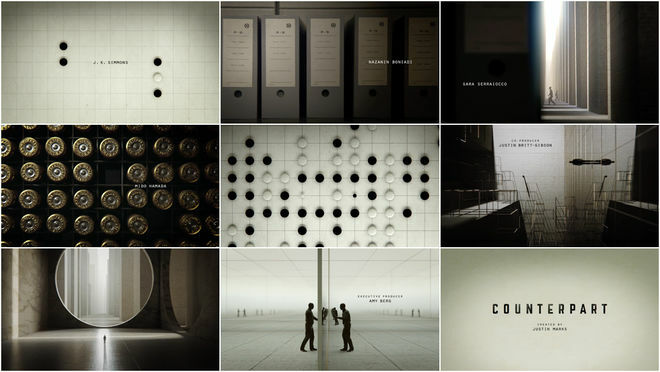 These are the questions at the heart of Starz' series Counterpart as well as the prompts used by Creative Director Karin Fong to produce its Emmy Award-winning title sequence. Read our in-depth discussion with Emmy Award-winning Creative Director Karin Fong. “Let's not be shy to say it,” says Christian Buss, Der Spiegel’s cultural critic, about Babylon Berlin. “We [Germans] are big again – as the world champions of angst." It is this angst that is front and center in the show’s hypnotic, Art Deco-infused opening created by German designer Saskia Marka. Hailed by critics as dazzling and dynamic, the 16-part series has been likened to the “German angst cinema” of the 1920s including silent films The Cabinet of Dr. Caligari (1920) and Metropolis (1927), both of which feature landmark title sequences. 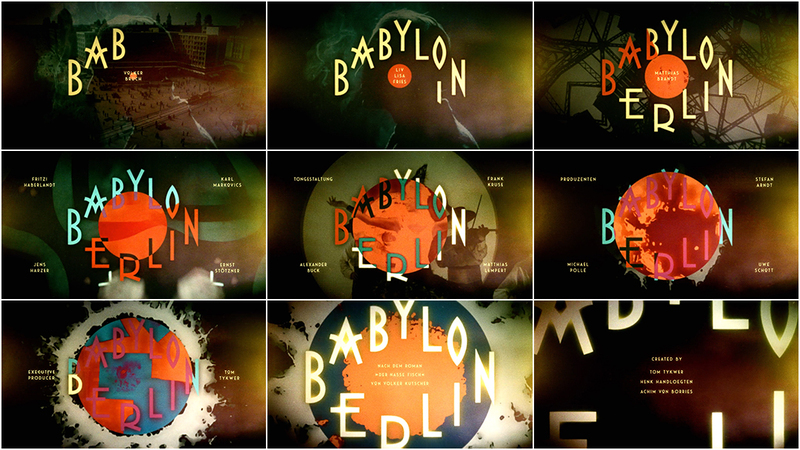 Taking place towards the end of the Golden Twenties of the Weimar Republic, Babylon Berlin premiered in Germany in October 2017 and was soon picked up by Netflix, debuting in the United States, Canada, and Australia in January 2018. It taps into growing international interest for depictions of German history and the rise of Nazism, deftly exploring the anxieties swirling through many cultures today. 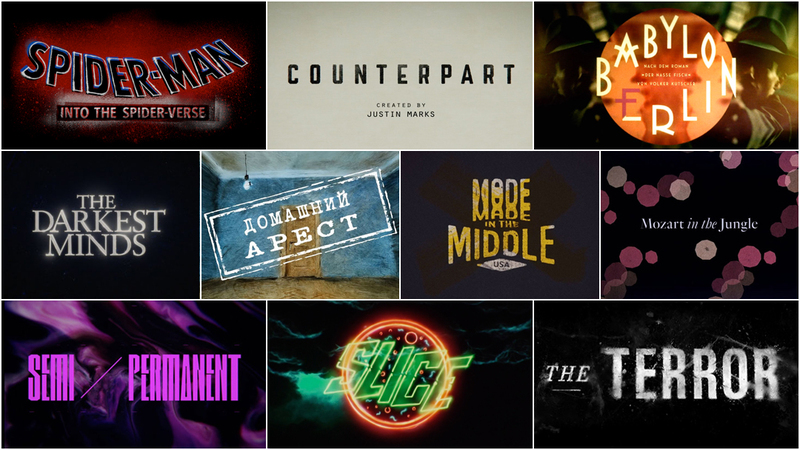 There are so many amazing title sequences we weren’t able to include in this top 10, but many of the year’s most notable sequences are available in our 2018 titles list. We recommend checking out the hilarious behind-the-scenes bloopers of The Happytime Murders, the mesmerizing ending to Annihilation, the Easter egg-filled opening to Castle Rock, and our in-depth article on the atmospheric titles to Deep State. Love our choices? Disagree with our picks? Did your favourite title sequence not make the cut? Join us on Twitter at @ArtoftheTitle and have your say. Thanks for joining us for another incredible year in title design. Here’s to an exciting 2019! Wakanda forever!